It’s a curious coincidence of timing that Babak Anvari’s debut feature is getting its stateside release in the aftermath—or maybe under the shadow—of its U.S. distributor Netflix’s online conversation piece Stranger Things, which it resembles in a few key ways while also being very much its own, much stranger (and better) thing. Like Stranger Things, Under the Shadow is at its core a story of a mother trying to protect her child from otherworldly forces, which in both cases enter our world through a cracked outer façade—the domestic space violently rezoned as contested terrain. And, no less than those John Carpenter–loving Duffer brothers, the Iran-born, London-based Anvari is an eighties baby, right down to the prominent use of a period-specific Jane Fonda workout tape, although the battered VHS cassette means something very different in the context of an international coproduction set in Tehran during the Iran-Iraq war. After calling a repairman to her bombed-out apartment, a woman has to remind her daughter to hide the VCR, lest their guest decide to report them to the authorities. Probably the most impressive thing about Under the Shadow is how it manages to integrate the social and political realities of its chosen time and place into the demands of a genre narrative, unlike Stranger Things, which shamelessly fetishizes its period signifiers before imposing just enough strenuously present-tense political correctness to ensure that critics won’t mistake it for something authentically retrograde. Anvari is not a pretentious filmmaker: it’s a good bet that he was raised on the same Amblin entertainments as the Duffers, or, for that matter, David Robert Mitchell (It Follows) and Robert Eggers (The Witch). But while he takes a similar delight as these North American filmmakers in reconfiguring the slow-burn-slash-shock-cut rhythms of the era to his own purposes, he’s ultimately doing something closer to what Australian writer-director Jennifer Kent attempted—and for many critics other than myself, successfully achieved—in The Babadook: a parable of maternal strength and fallibility charged by the most primal fear of all, which is that our children will be lost when we’re not looking, or else disappear inexplicably before our eyes. As we meet Shideh (Narges Rashidi), she’s about to go into a meeting with a university administrator who will determine whether or not she’ll be allowed to continue pursuing a medical degree in light of her left-wing activism during the Cultural Revolution. Her anxious expression suggests that she’s not exactly confident in the system, and if the brief, terse conversation that follows is somewhat predictable—he shuts her bid down without a second thought—it’s still staged and acted with a feeling of palpable hurt rather than political point-scoring. Aided mightily by Rashidi’s remarkably open features—her wide eyes transparently convey wariness, anger, and alarm—Anvari puts us on the side of his heroine without simply turning her into a symbol of gender repression. When Shideh places a medical textbook given to her by her mother in a locked drawer, it’s a vision of entrapped individual aspirations that can also be read as an image of knowledge tucked away beneath the weight of theocratic rule. 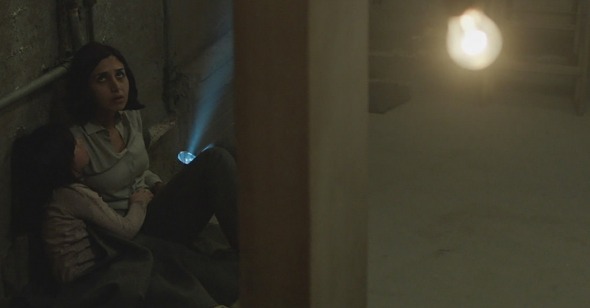 The same poetic-didactic ratio applies to the running leitmotif of x’s strewn through British DP Kit Fraser’s alternately spacious and cluttered widescreen frames, from the masking-tape crosses that Shideh and her husband, Iraj (Bobby Naderi), have affixed to their windows to minimize shattering to the craterous, cement-lined entry wound left by an Iraqi missile in the roof of the apartment upstairs. The routine clang of the air-raid siren provides the soundtrack for the family’s day-to-day routine, including frequent trips to a dingy bomb shelter, which means that Under the Shadow is pressurized long before its fully explicable horrors give way to more mysterious goings-on. The idea that the weapons of war come bearing stowaways from some other plane of existence is developed slowly; perhaps the sharpest point of Anvari’s screenplay is that the discovery that Shideh’s six-year-old daughter, Dorsa (Avin Manshadi), is being stalked by a malevolent Djinn—a trickster figure of Persian mythology—doesn’t cancel out the threat embodied by the war, but rather entwines with it so that the forces of both modernity and superstition seem arrayed against the protagonists. The missile strike is the impetus for most of Shideh’s neighbors to try to leave the apartment complex and Tehran as a whole, but she stubbornly opts to stay behind—a decision subtly tied to her professional frustrations and annoyance that Iraj, who works as an army doctor, has been conscripted to the front lines, as well as to a fierce and abiding sense of pride that complicates any notion that the character is merely a victim of her surroundings. Shideh’s refusal to be scared out of the home that her society expects her to maintain dutifully and without a word of complaint is ringed with a vicious irony, and the tension between her stifled ambitions and the larger chaos unfolding around her is compelling enough to hold our interest in the moments that the film isn’t exercising its spook-show mandate—patiently at first, with recurring daydreams and nightmares that stop short of revealing bump-in-the-night intruders. Later, the visions become more extreme than Western audiences accustomed to a Persian cinema of inference and allusion might reasonably expect. The Djinn is focused on Dorsa, but in a smart move, Anvari limits the point of view almost exclusively to Shideh, just as Kent filtered the hallucinations of The Babadook through her heroine’s subjectivity. In this way, both films bow to the enduring ingeniousness of The Exorcist, where William Friedkin understood the potency of turning an innocent little girl into a (crab-) walking alienation effect. In a way, Under the Shadow inverts the project of The Exorcist, in which the avatar of an ancient evil (conjured up, incidentally, in Iraq) turns Regan MacNeil (Linda Blair) into a lurid cartoon of youth-culture insubordination, requiring the intervention of a respectable religious figurehead; here, the Djinn—which takes the very suggestive form of a ephemeral, black-cloaked phantom—is trying to steal Dorsa back on behalf of a set of old-world traditions. The isolation of the characters in an increasingly dark and destroyed apartment skirts Polanskian paranoia—a sense of internal torment projected into the physical world. Meanwhile, the cruelty of the Djinn’s terrorizing tactics—i.e. taking on the form and voice of Iraj to question and ridicule her capabilities as a mother, or hiding Dorsa’s doll as a prelude to a forthcoming abduction—is made clear without much expository dialogue, or even the overtly personalized menace of Mr. Babadook, whose flimsiness as a psychological construct keeps the film bearing his name cozily inside the same realm of is-it-real-or-not ambiguity that Under the Shadow emerges from in its final scenes, and in more ways than one. A late shot of the doll’s head left behind in a greyed-out stairwell gets at the idea of lingering trauma—of a mind that’s always going to be at least partially somewhere else at all times—at least as eloquently as the end of The Babadook, and without any kind of slyly mollifying impulse. The lack of a “twist” in Under the Shadow, of some piece of narrative or formal gamesmanship that recasts everything that’s come before in a new light—à la the wonderfully wry coda of The Witch or the portentous multiple false endings of The Wailing—reflects its specific principles as a horror movie. Not only does Anvari fold allegory into storytelling, but he also plays fair with his audience down to the last couple of jump scares—an M.O. that he’s thankfully not above exploiting for maximum effect. By neither condescending to nor over-conceptualizing genre, he honors it, and seems poised to break through, however modestly, in a North American marketplace that has historically preferred its subtitled Halloween-season imports to come from further east. Under the Shadow is skillful and scary enough to be a legitimate niche hit. Stranger things have happened.